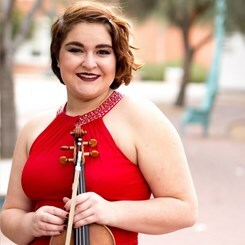 Gabrielle Dietrich is a third year college student at the University of Arizona studying Violin Performance under the tutelage of Lauren Roth, concert master of the Tucson Symphony Orchestra. She first picked up the violin at age six when she was introduced to the Suzuki program at Northern Arizona University. From there she has continued to grow and study under many teachers and instructors. In her career, she has participated in many festivals and national orchestras, most recently the Marrowstone Festival Orchestra in Bellingham, Washington. She has also served as concert master of both the Arizona Music Educator's Association Northwest Regional Orchestra and the Arrowbear Festival Orchestra. She has also participated in a multitude of chamber ensembles over the years through various programs. She is currently a member of the Arizona Symphony Orchestra as a section violinist and is the leader of the Victory Quartet, both groups from the University of Arizona. As a teacher, Ms. Dietrich uses a combination of both the Suzuki method and her real world experience to educate both young children and adults. She began teaching at age sixteen and has slowly grown her studio to include students of all ages and backgrounds. No two students are alike and Ms. Dietrich believes each individual lesson should be treated as such. She believes that the only way to teach a student is to make them feel successful in everything they do and to show them how to be successful in the most efficient way possible. By doing so, she knows each student will be able to flourish, grow, and create beautiful music. Request Lessons with Gabrielle Dietrich today!